I’m sure like many Brits chips have certain evocative memories; for me they split two ways. The first is good ol’ fish and chips, eaten from paper along Southend seafront, stained with vinegar and gritty with salt, chilly breeze from the sea in the air. The other memory is of my Nan’s chips. She would peel the potatoes, chop them into chunky pieces (we’d call them wedges these days) and deep-fry them from raw until nearly dark brown. It doesn’t sound great but they had a thick crust and packed a potato punch, and I miss them terribly. Fast-forward a little and I’m gazing down at Heston’s triple-cooked chips. They’ve taken a while to do (as do most of his recipes) but the proof is in the eating: a brittle brown crust, golden skin and that cheeky deep-fried smell. The flesh inside is giving and fluffy – exactly what you want. They are, as you expect from the man, perfect. There’s a little faff involved, but the ingredient list is very short. 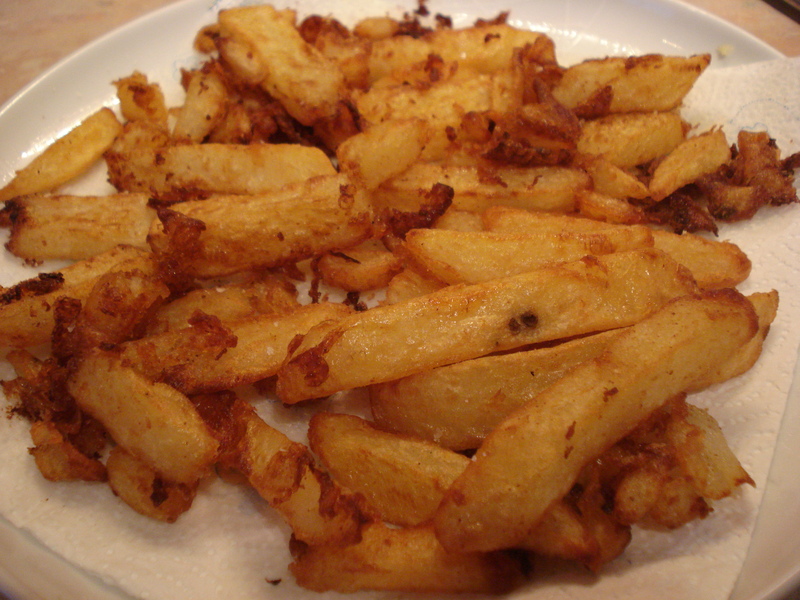 First the sliced potatoes are par-boiled on a gentle heat, then deep-fried, then deep-fried again. Between each stage the potatoes are chilled and dried out thoroughly. 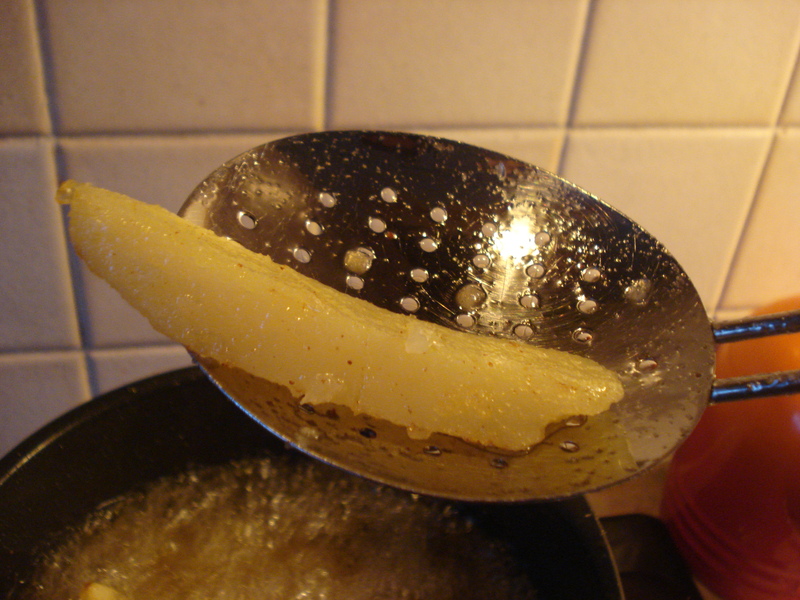 Removing as much water as possible is crucial to drying out the chip; this ensures maximum crispiness. It may be a lot of stages but one big advantage to this method is that you can stop and refrigerate the chips at any step until needed, so all the legwork can be done well in advance if needed. When it comes to frying I use a deep saucepan filled a third with oil; I’ve owned two deep fat fryers in the past. One just plain stank, the other melted. Yes, melted. A bit of a drawback for a deep fat fryer. You can read his recipe in either In Search of Total Perfection (as part of fish and chips) or Family Food: A New Approach to Cooking (Penguin Cookery Library) . The only discrepancy is between the boiling stage; one says to salt the water, one not to. I decided to go with instinct and as if they were roast potatoes, salted them. You can also find variations of this recipe at Waitrose, The Times, and an interesting accompanying interview (plus sciency bits) at RSC. Sliced the potatoes into 2cm thick chips. Don't be too fussy about this; uneven things are charming. Rinse the potatoes well under running water to remove excess starch from the surface (this will stop them clinging together in the fat). Plunge the chips into salted boiling water and reduce the heat to a simmer. This will ensure the middle is cooked thoroughly before they turn into mush. Remove from the water when a knife point slides in easily - this will take about 10 minutes. Drain the chips well and put in a single layer on a tray. Put into the freezer for 30 minutes to completely dry them out. Bring a plain oil (e.g. rapeseed) to 130°C - use a probe or sugar thermometer to achieve this. 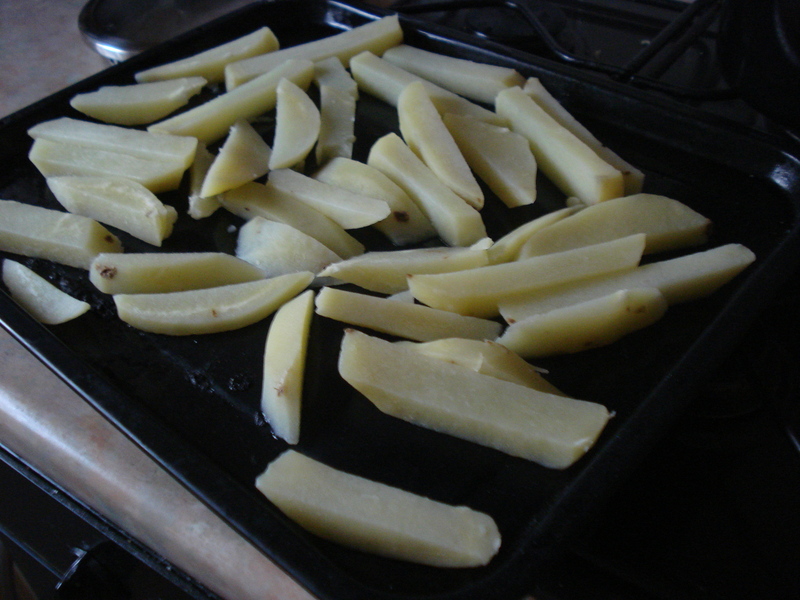 Drop the chips in and fry until they turn a very pale yellow and as Heston says, "have a dry appearance". It's an odd description but you'll know it when you see it. Don't let them turn brown. This will take another 10 minutes. Drain again, bake on the tray and back in the freezer to dry out. Bring the oil up to 180°C. Chips back in, now let's get them coloured. Keep them in there until you get a nice dark brown on the edges. Yep, another 10 minutes. When done drain thoroughly and chuck on the Maldon sea salt - they can take quite a bit. They look delicious. Made me feel hungry and I’ve just eaten my breakfast! Luckily for you, chips make a great brunch (!). Done these twice. First time was awesome, second time was so-so because I used the wrong type of potatoes, which screws up the cooking time. Funnily enough, we had double-cooked Maris Pipers at the same pub for the second time last night and they weren’t as good as the first time. It’s a sign of too much food geekery that I immediately pinpointed the problem as being that the oil wasn’t hot enough when they fried them! As for deep frying in a saucepan (which is what I do), this may be an obvious tip, but if you want to reuse the oil (for deep frying only of course), put a funnel into the bottle and line it with a coffee filter paper to remove all the burnt/solid/excessively flavoured bits. Oil not being hot enough does become easy to spot when you’ve done it yourself. Well done on the funnel tip – I also invested in a set of saucepans that all have lips for easy pouring. Much easier! The coffee filter tip……….genius! How have I never thought of this! You may well be right but I don’t remember reading the McDonald’s cookbook where the recipe was published! SteveB McDonalds chips dont taste any where as nice. As with many of Heston’s recipes, the temperature is critical here. Let us know how you get on. Just a quick question, hoping someone can help me. I’m planning to make these chips tomorrow night but I don’t really have enough room in the freezer, could i put them in the fridge for a longer time, will this do the same thing? Yes you absolutely can. Heston’s original recipe does put them in the fridge, I used the freezer for speed. By the way, I have a tiny freezer but laid the chips out on a baking tray in one layer so they took up hardly any space, if that helps. 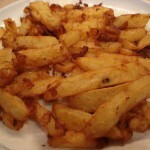 I did this by par-boiling first, then baking them on a medium heat until they went a bit crispy – then deep frying them. The effect was in between a chip and a crunchy roast potato. V Good. Nice twist Giacomo. I’ll give that a try! going to try these tonight, I’ll let you know how they go fingers crossed. thanks for the great info by the way. I parboil the chips for around 10 minutes, leave them to dry in a colander over an empty pan, then deep fry at 190 degrees watching them all the time. Always taste great, no need to spend an hour making chips! “Wala” is now my new favourite word. Nice recipe. I only boil for 3-4 minutes, but my stove’s propane so they take longer to reach a boil. I also ‘roughen’ them up a bit after draining, either by stirring in the pan or putting a lid on and shaking briefly. I spread ’em out to dry them up a bit, a spell in the freezer helps with drying too. I do huge batches (10 lbs at a time) and freeze them in vacuum bags after the blanching fry. ‘Un-vacuum’ and thaw and they’re ready for the final fry, saves time and they’re really good with a bravos sauce! Bon appetite. Thanks for stopping by. What’s bravos sauce? mine did not turn out to be crispy from the outside although the final temperature at which i fried was right. what could be the reason? It does sound like the final temperature was too low, or perhaps they weren’t drained before serving? It’s also possible when they are overcooked the crust breaks down and starts to let in oil.